Despite being able to put three teams on the podium at New Balance Nationals Indoor, New York still had one perennial distance medley relay favorite missing from the mix this indoor championship season. 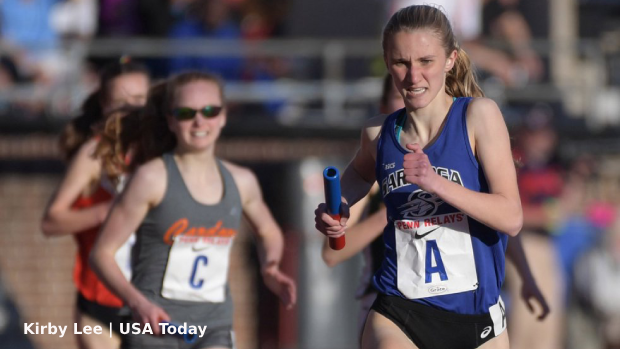 Saratoga Springs had opted for only individual events this year, highlighted by its freshman, Ella Kurto, taking fifth at states with an impressive 9:44.83. Much of that decision came from a needed break for star senior Kelsey Chmiel, who had begun developing pain in one of her legs at the beginning of indoor. The plan had originally been to shoot for a spot at U20 XC Champs after racing the qualifier in Tallahassee in February, but the lingering pain shifted the focus to recovery for one final spring season. That season is here, and Chmiel is back and ready to run. After throwing the Shot put indoors, and the early season dual meets to remain eligible (she got her PR up to 19-5! ), she returned to action on the track in a dual meet last Wednesday, and took to a relay on Saturday at the local CBA/LaSalle Relays. While no official splits are available, the DMR ended up running 11:44.02, good enough for US No. 1. The squad took the gold medal by nearly two and a half minutes. The mark would make them NY No. 2 when combining with the marks from teams who ran at Indoor Nationals. There, North Rockland, Fayetteville-Manlius, and Ursuline all made the podium in the event. They ran 11:41, 11:45, and 11:51 respectively.